I would like to cordially welcome Jean-Claude Juncker, President of the European Commission in Georgia. It is worth noting that this is his first visit not only in Georgia, but also in the entire region. 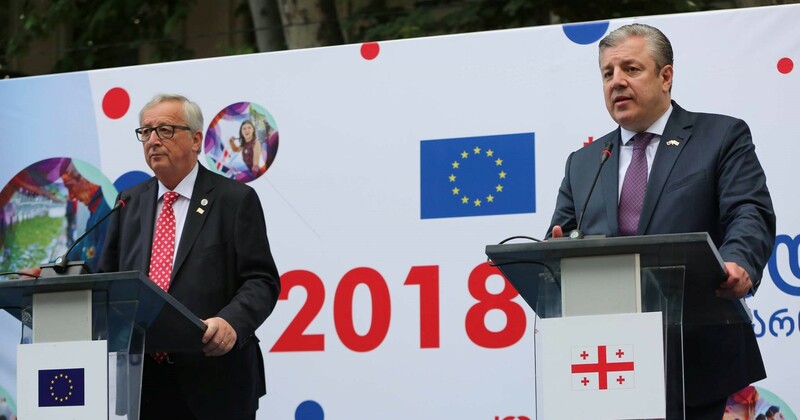 The fact that the president of the European Commission visits our country and we jointly celebrate such an important event underlines once again the strong support of the EU to our country and to the process of Georgia's European integration. I also would like to welcome Johannes Hahn, European Commissioner and delegation of Jean-Claude Juncker in Georgia. European Commission supports Georgia in the implementation of crucial reforms and I want to thank very much Jean-Claude Junker personally for his contribution in the process of providing support to Georgia. We have achieved important success in the process of integration into the EU. Today Georgia has Association Agreement and under this agreement - agenda of reforms. We also have the free trade agreement and Georgian citizens can travel visa-free to Schengen area. The EU is committed to Georgia's path of reforms and modernization. With reliable financial and technical support of the European Commission a number comprehensive reforms have been implemented in our country that have brought important success. Through the approximation with the EU's legal and institutional standards we are making significant changes to political, economic and social life of our country. It is very important to point out the crucial role of the EU in maintaining peace and stability. The EU is the key participant in the Geneva International Discussions and Georgia is very thankful for the EU's consistent position in view of protection and acknowledgement of Georgia's sovereignty and territorial integrity. I will not speak a lot, taking into account that the weather can change soon. On behalf of Georgia's citizens and the Government of Georgia, I would like to once again thank the President of the European Commission for visiting Georgia. Now I would like to let the President of the European Commission to personally announce the very important agreements reached by us to the population of Georgia. Thank you very much Mr. President. The floor is yours! Dear Giorgi I am delighted to see the EU playing such a full and visible role on this very special day for Georgia. I am very proud that the PM is visiting our stand, this is the stand of EU and it's good to have him with us. We have come a long way together in a relatively short period of time. I thank him for his European spirit and for always having the courage of his convictions, which doesn't happen so often in Europe. Georgia is a country close to my heart, close to the heart of Europeans, because we are friends and partners by our history and by our geography. Many other European countries are celebrating their 100 years of independence. In these days I'm particularly proud and happy to be here today, because this is a very special day for Georgia. I promised the PM years ago that Europe will always be on the side of Georgia. The more you reform the more support we'll give to our friends. I am delighted that today I can announce an extra 40 million worth of funds for this year's bilateral allocation. This brings to 597 million of total of our financial support to Georgia from 2014 to 2018. And on top of that we have the possibility to announce a fresh of financial assistance worth 45 million. I have to speak up because of weather. No, I am not finished, I have more money in my pocket. What I wanted to say is that according to a promise i gave to PM we have liberated the visa regime in March of 2017. More than 353 000 Georgians have traveled to Europe and i would like to invite all of those who are here to go there, because it's worth being visited. We are launching in a few months from now a European school here in the city and we have agreed with PM and myself to have one annual meeting between the GoG and the Commission. We are not doing this with every country but I would like this to happen year after year. Thank you. Thank you very much, Mr. President! This is a great honor for us. From today, a completely new, top level format is created and once in a year the President of the European Commission, Jean-Claude Juncker, Prime Minister of Georgia and members of European and Georgian Governments will meet to discuss the progress in the process of Georgia's integration and plan future actions. This is an extremely important decision and of course Georgia is grateful for increased funding on which the President of the European Commission Jean-Claude Juncker has just spoken. Thank you once again for being here and for supporting Georgia. Thank you also for the decision on the European School on which we have worked a lot together with European Commissioner Johannes Hahn and I am happy that we have announced the decision today. Thank you, Mr. President. This is an unforgettable day for Georgia; your visit is a historic event for our country!